Not to be confused with canzone. A calzone (US: /kælˈzoʊn(eɪ), -ni/, UK: /kælˈtsoʊni, -neɪ/, Italian: [kalˈtsoːne]; "stocking" or "trouser") is an Italian oven-baked folded pizza that originated in Naples in the 18th century. 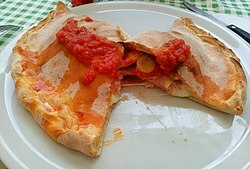 A typical calzone is made from salted bread dough, baked in an oven and is stuffed with salami, ham or vegetables, mozzarella, ricotta and Parmesan or pecorino cheese, as well as an egg. Different regional variations on a calzone can often include other ingredients that are normally associated with pizza toppings. Traditional calzone dough, consisting of flour, yeast, olive oil, water and salt, is kneaded and rolled into medium-sized disks. Each is then filled with cheeses such as ricotta, mozzarella, Parmesan, provolone, and other traditional vegetables or meats. The dough is then folded in half over the filling and sealed with an egg mixture in a half-moon shape, or is sometimes shaped into a ball by pinching and sealing all the edges at the top. It is then either baked or fried. In some areas, just before serving, they are topped with marinara or other traditional sauce, or with a mixture of garlic, olive oil and parsley. Similar dishes are scacciata and stromboli. In Italy, as of the 1960s, calzones were popularly believed to be the most efficient type of pizza for home delivery. This popular credence had some scientific ground as the folded nature of the calzone results in a lower surface-to-volume ratio than a traditional pizza resulting in better heat retention during the journey from the pizzeria to the buyer's home. This results in a calzone being delivered warmer than pizza, all other things being equal. ^ "dictionary.com". Dictionary.reference.com. Retrieved 2012-11-07. ^ "calzone | Jamie Oliver | Food | Recipes (UK)". Jamie Oliver. Retrieved 2012-11-07. ^ "History". The CalZone Zone. ^ MacKenzie, Shea (1995). The Pizza Gourmet. Garden City Park, N.Y.: Avery Pub. Group. pp. Preface iv. ISBN 089529656X. ^ Annamaria Settanni McDonald. "Puglia panzarotti". Justapinch.com. Retrieved 2012-11-07. Wikimedia Commons has media related to Calzone. Look up calzone in Wiktionary, the free dictionary.